Flystrike is the second most costly disease nationally that affects sheep after gastrointestinal parasites. The severity of the problem varies between years, depending on rainfall, but it is a problem in weaners in most years. Flystrike control and prevention are based on integrating management to reduce sheep attractiveness to flies, long-term genetic selection for less wrinkly breeches and less daggy sheep, strategic jetting in the high-risk period and using fly biology to minimise fly numbers. 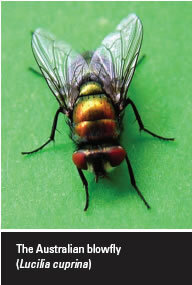 All aspects of management are important to control flies to reduce production losses whilst maintaining sheep welfare. Strategic management to minimise chemical use is important to reduce the risk of chemical residues as well as reducing the risk of developing resistance. Dock lambs at the third palpable joint of the tail and use the modified mules as indicated in guidelines from the National Mulesing Accreditation Program. All mulesing contractors and sheep producers mulesing their own sheep must undergo training for mulesing. Lambs to be sold for slaughter should not be mulesed but docked with the correct tail length. The use of pain relief is recommended - your veterinarian can prescribe appropriate products. Research shows that Border Leicester x Merino ewes used for lamb production are at much lower risk of flystrike when mulesed. Extensive research by AWI is investigating alternatives to mulesing. Time of shearing has a major effect on the risk of flystrike. Shearing just before the major fly risk time will reduce the need for jetting to prevent flystrike and supervision for flystrike. In addition, crutching before the major fly risk period will prevent breech strike for a few months, especially if sheep are scouring and have dags. Avoid excessive crutch size as there is no reduction in risk of flystrike compared with moderate crutch size. A large crutch will reduce fleece values by at least 50 cents/head. Scouring is a major risk factor for flystrike. Effective worm control will reduce the risk of breech strike. Selecting sheep for low dag score is heritable and, over time, will help reduce scouring. Selecting for low WEC will reduce worm contamination on pasture and in the longer term, help control worms. Select for low breech wrinkle, since this is strongly related to breach strike and if suitable sheep are available, select for low breach cover. Selecting sheep with less fleece rot will also reduce the risk of body strike. Spray-on applications of chemical (jetting) is an important strategy to prevent body and breech strike during high risk periods. This is especially important when flock supervision is limited. Choice of product needs to be based on length of protection, labour availability, skill level, efficacy, withholding periods for wool and meat and cost. Effective jetting equipment and correct technique are important to ensure that the chemical provides long-term protection.